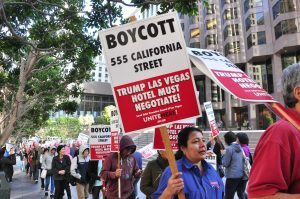 Culinary Union Local 226, UNITE HERE, the certified bargaining representative of workers at Trump Hotel in Las Vegas, cited federal law allowing boycotts for the purpose of forcing an employer to honor its duty to bargain with workers. 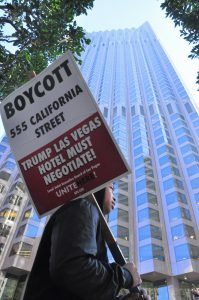 Members of UNITE HERE, representing 270,000 working people in hotels, gaming, food service, manufacturing, textile, distribution, laundry transportation, and airport industries, came together in San Francisco yesterday to picket for solidarity with their union brothers and sisters in Las Vegas who have been routinely ignored and disrespected by Trump. Union members, organizers, and community justice activists have come out to protest atop a windy hill where the humongous 555 California stands high and mighty, a building of which Trump holds part ownership. Trump has a long and troubled history of cheating workers. His disregard for his workers should be a clear signal about his priorities and how harmful a Trump administration could be for working people across the country. 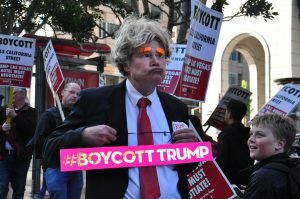 In peace and in solidarity, California Labor proudly supports #BoycottTrump, and we encourage you to do the same.